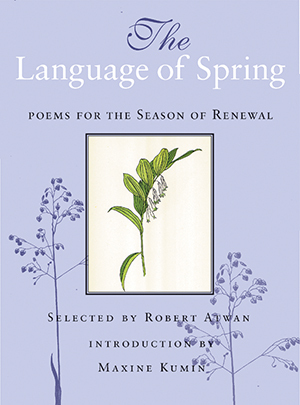 The Language of Spring collects some thirty of the most evocative English-language poems on the experience of spring. The poems range from the traditional and formal (Gerard Manley Hopkins’s “Spring” and Edna St. Vincent Millay’s “English Sparrows“) to the contemporary, experimental, and diverse (Henry Reed’s “Naming of Parts,” Marie Ponsot’s “Mauve,” and William Carlos Williams’s “The Widow’s Lament in Springtime“). Each poem beautifully illuminates another small spot of time in the enthralling season of renewal. Other contributors include: Maxine Kumin (the volume’s title is adapted from her poem), Robert Frost, Emily Dickinson, Mary Oliver, Richard Wright, John Updike, Walt Whitman, Yusef Komunyakaa, e. e. cummings, D. H. Lawrence, Claude McKay, Jane Kenyon, Sara Teasdale, Philip Larkin, Anne Sexton, James Tate, and A. R. Ammons.